HOW WILL MY BABY BE HAPPIER With Beaming Baby Size 6 Diapers? YOUR HAPPINESS GUARANTEED with Beaming Baby XL Diapers! 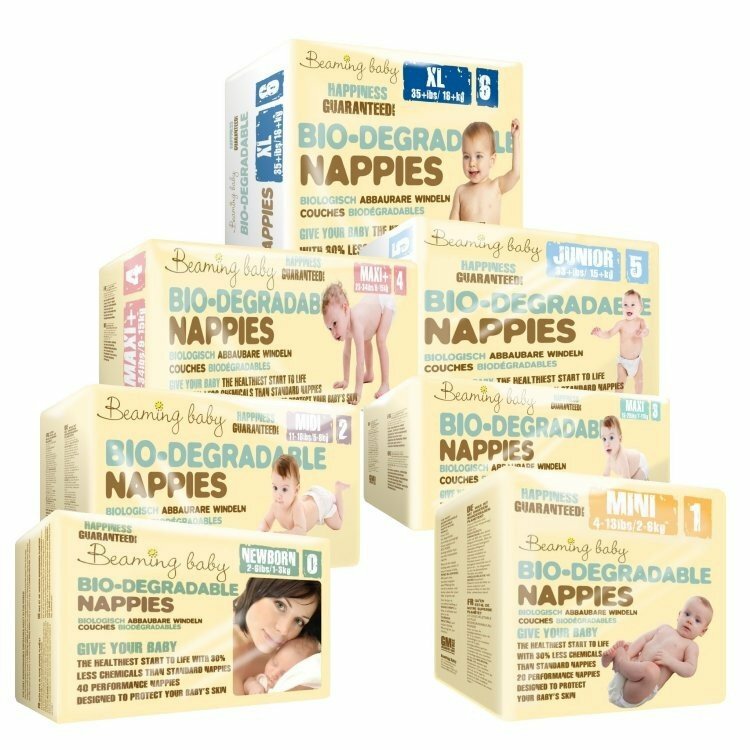 Beaming Baby Bio-Degradable Diapers Size 6 are Totally Chlorine Free and contain only Clean Plastics which are used in the Velcro patch and elasticated back and side panels. I love these diapers. My baby's skin is sensitive, and has had absolutely no problems whatsoever with these diapers. When on holiday, we used a commercial brand, and sure enough, by the end of the holiday our baby had irritated skin. These diapers are surprisingly absorbent. Highly recommend. Best diapers - no leaks, no harming chemicals and no diaper rash! The Best diapers!! Found when searching for environmentally friendly products due to hating other branded diapers!! I've used them for both my children and never looked back! They are the first diaper I recommend when asked!! No diaper rash, no leaks and don't smell or have harming chemicals!! Love these diapers and tell our friends to get them! Love that the impact of the diapers on the earth is reduced and that I can know there are no chemical nasties close to my baby's skin. Happy customer! Have used Beaming Baby diapers for almost four years, for two children at night (we use reuseables in the day) and they are brilliant and mostly leak free. Best diapers on the market. I needed to change diapers for my daughter - as she got rashes from ordinary pampers. And Beaming Baby choice is really good. No rash, no leacks also. Beats all other eco diapers! We tried every other brand of eco-diaper on the market to control nighttime leaks, then discovered beaming baby - I wish we'd discovered them before! Not one leak since using the junior diapers, we are all happy and the washing has reduced considerably! Always happy with Beaming Baby! Always happy with their products, I've been a customer for a year and wouldn't change brand for any reasons. Amazing diapers, wouldn't buy another brand! Order diapers and wipes every couple of months! Baby never had nappy rash and we've never experienced a 'leaky' diaper! Best diapers in the world! Diapers are amazing. My son suffered terribly with rashes no matter what i did and used. Beaming baby resolved this! Thank you!" Great service and wonderful diapers. Super reliable. We've been using them for 2 years now and we've never had any leaks. Great product. Another happy customer. Would highly recommend to others. The diapers are amazing. I have two girls, and the minimal about of chemicals is very noticeable and a huge plus in my continual use of this product. After child #1 was starting to show signs of diaper rash at 3 months I switched to Beaming Baby and never looked back. One time I had to use another brands product and the outright smell of chemicals shocked me, did not realize how great these diapers are until I didn't have them to use.